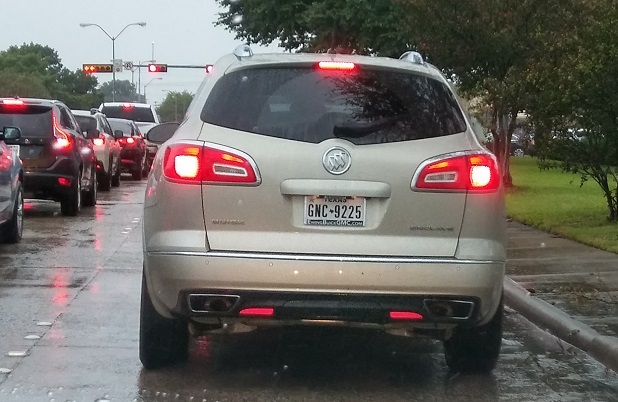 Event Description: This psycho lunatic driving IN THE DARK, IN THE RAIN with NO HEADLIGHTS ON, almost RAMMED me at the red light at Independence and Plano Pkwy, and then AGAIN at Independence and 15th Street! The front end of this SUV COMPLETELY DISAPPEARING under my rearview mirror, which means this VIOLENT PSYCHO was LESS than 6 inches from my rear bumper!!!! IN THE RAIN, ON HEAVY WET ROADS!!!! And not only did this psycho douchebag almost RAM me at TWO RED LIGHTS, AND DRIVING WITH NO HEADLIGHTS ON IN THE DARK, IN THE RAIN, this psychopath piece of crap was DRIVING ON MY REAR BUMPER GOING DOWN Independence road, IN THE RAIN, ON FLOODED STREETS!!! Another violent, deranged psychopath the Plano “police” refuse to do anything about!